You need to enter a Windows 8 Product Key while you are in the process of installing Windows 8 in your system. When I installed Windows 8 on my PC, I had to enter a product key. The fact is that ou can nor proceed further towards the next upcoming step. 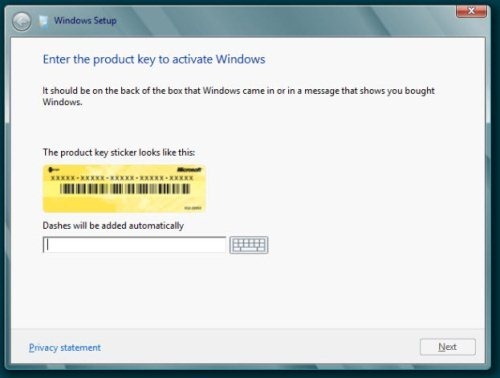 Here’s the short-cut of the Windows 8 Product Key screens where you need to enter a correct Product Key to move a step ahead. Th screen will stay there until you enter a valid key and click on next to move towards further step. But, we will have to wait and look if the next big Windows 8 version will require to enter the Product Key. Yes, you read it correct. The next big version is ready to launch in somewhere around October. Read the entire post on Windows 8 next release. Mandatory Activation: The main purpose of activation is to avoid misuse of unlicensed activation. Activation automatically occurs when you are connected to internet to update Windows. This Windows 8 product key screen is bit different from Windows 7, the way we used it. At last, we can’t say, Is it permanent or temporary to enter product key in Windows 8 installation procedure. But, this might be annoying for some users who need to look for product Key at each time of installation. Windows 8 Product key Released by Microsoft which is mandatory for new installation or reinstallation of Windows 8. The consumer preview is programmed to stop working at I thought the 15th of January. Is this triggered by this key, and if so, is there a key which gives permanent access to Windows 8? @John: No key yet to make Windows 8 run permanently in free mode.